Medicine is one of the few professions where learning isn’t a pastime or luxury— it’s a necessity. The Department of Surgery recognizes this fact and it remains at the forefront of the field by aggressively seeking and creating new knowledge that enhances patient care and advances the specialty. 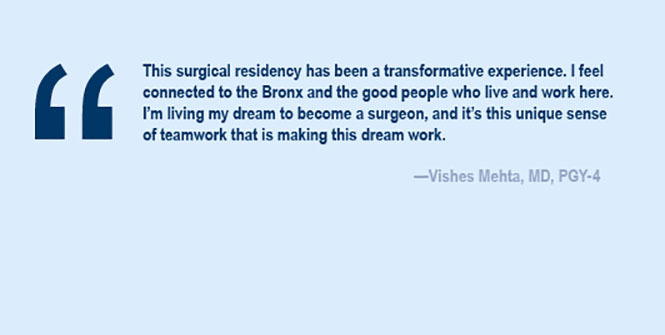 They instill this same passion for discovery and clinical excellence in every resident and fellow in the Department of Surgery’s nationally respected training program. 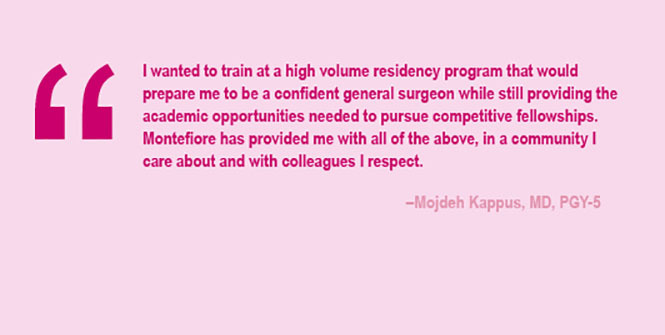 Certainly the clinical experience at Montefiore is strong, and residents graduate with a reputation for being able to operate and having matched well for fellowship programs. Residents have the opportunity to choose a faculty mentor to assist with research or career development, but many residents find they develop good relationships with most attendings, and strong relationships with several attendings, some that last beyond general surgery residency. The program has focused its attention on its educational program with the development of focused services and protected educational conferences. That residency can be challenging is a given, but resident camaraderie has traditionally been one of the program’s strengths.